They say (and I whole heartedly agree) that you should purchase a pair of jeans that fit through your legs and bum at your local consignment/thrift/discount store, and use a T-Shirt for the band. Apparently your total costs for this project could add up to less than $10 (depending on the price of the jeans). 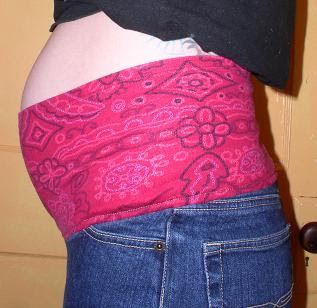 So, spend less than an hour with your sewing machine, and get the best pair of maternity jeans a girl could have! Do you have any tips for maternity clothes (buying, making, or altering)? Leave a comment or drop me a line at uberchicforcheap at gmail dot com. What a great idea! Too bad it's about 2 years too late for me. Dang-it! Everywhere I have read information about doing this, people wish they had known earlier, so I figure I would tell everybody now! Too bad you missed it, hopefully I can figure it out when I need it. Hey madeline! i like this idea...i'll let you know if I do it and how it goes. My maternity advice is get LONG shirts that stretch, you can wear them after, and they don't have ties or pleats or anything like that, and they cover the elastic on maternity jeans. I like shades-from costco of course, and downeast basics, anyhow, I love a good bargain, keep them coming! Love this idea.. Maybe with my next baby you can help me make some. Such a great idea. I'll have to try it for the next baby to come. Sounds easy. Thanks for the post! If only if only I had learned about this 6 months ago. Oh well, there is always the next one. Thanks for all the comments guys! So glad that you are all getting something out of this thing.